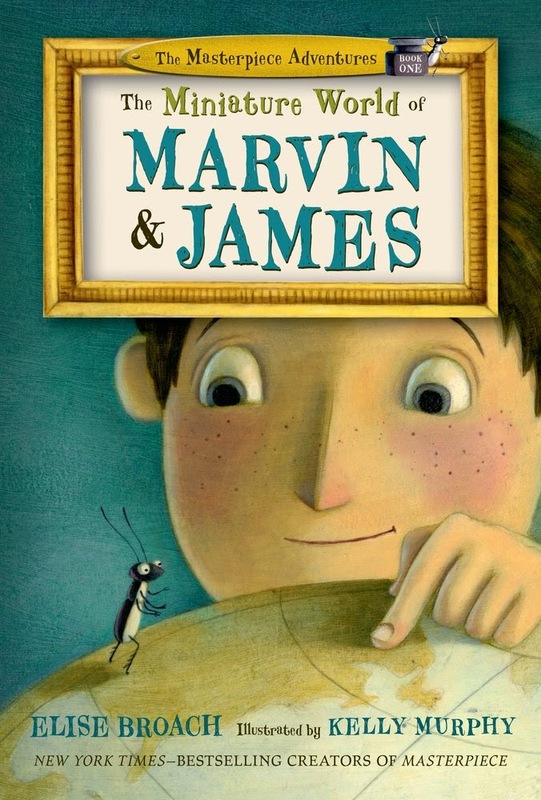 The Miniature World of Marvin and James begins a new companion series by Elise Broach, The Masterpiece Adventures. 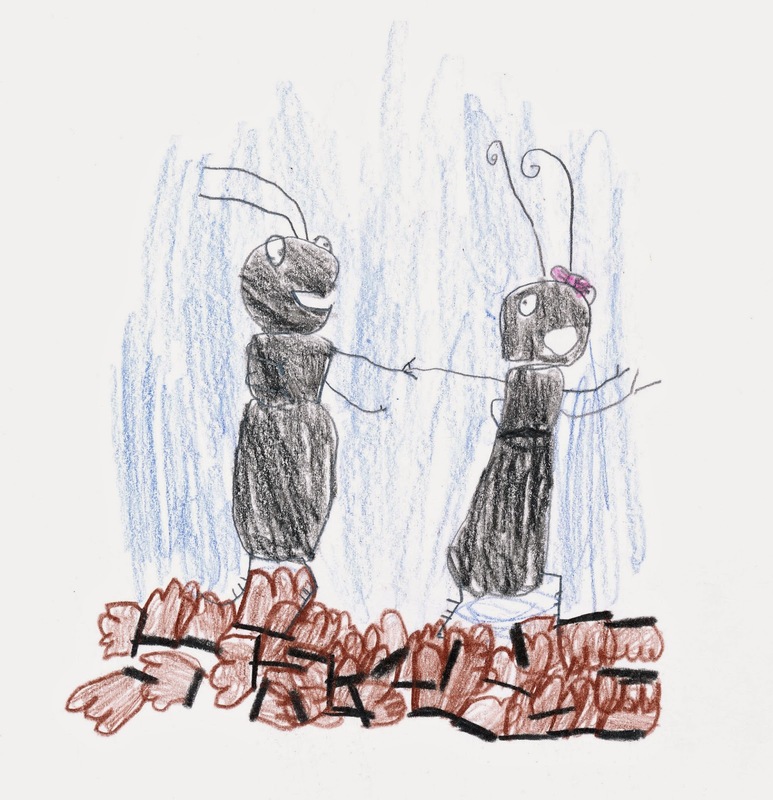 In this beginning reader story, Marvin the beetle says goodbye to his best friend James, who is going on a weeklong vacation to the beach. While he is gone, Marvin's plays with his annoying, but fun cousin, Elaine, and she leads him on an unusual adventure that distracts Marvin from missing his friend. The amusing dialogue and engaging illustrations are sure to entertain young readers as they experience a big world through miniature eyes. For this story, we thought we would let the kids do the talking. These are some reviews from their perspective. My favorite character is Elaine because she likes to go on adventures. She keeps Marvin company while James is out of town at the beach. I think it's fun when Elaine and Marvin go into the pencil sharpener. They almost couldn't get out, but luckily Marvin came up with a plan and they were able to escape. I also think it is funny that Marvin has his very own miniature art studio under the sink. 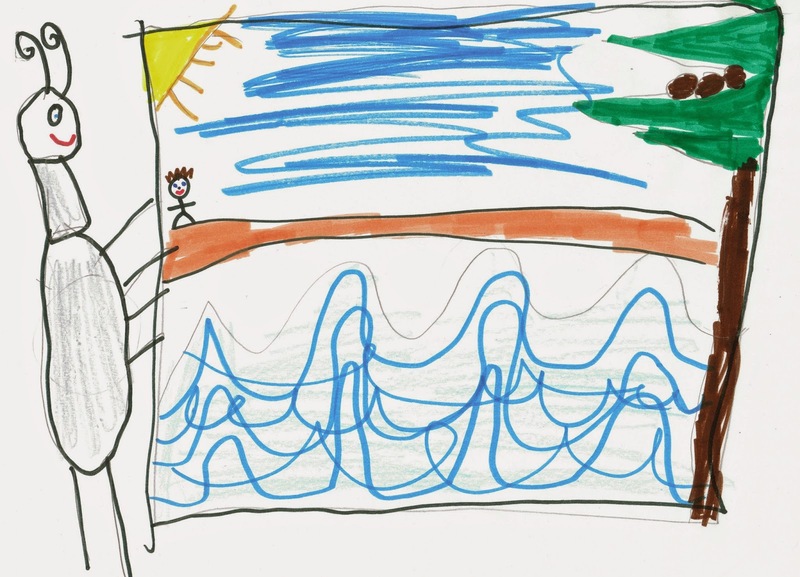 He even drew a picture of the beach for James! Elaine is great character because she wants to go on a fun adventure! She's excited and happy. She's playful and does somersaults, dives, and even a belly flop. She is just so cheerful! I like the part of the story when Elaine and Marvin go into the pencil sharpener because there are soft wood shavings that they jump in a lot. They dive in them over and over again. We are 11 days into our summer vacation, and while my kids enjoy being outside, they have already had plenty of inside hours to fill. I found Rainy Day Book of Things to Make and Do while browsing through kids' craft books in March, and I knew it would be perfect for summer days (rainy or not). The book is organized into 8 sections ("Fun and Games," "Top Toys," "Rad Room," "Great Gifts," "Dazzling Decorations," "Cool Cards and Papercrafts," "Funky Fashions," and "Awesome Accessories") and includes a variety of projects (twig letters, pebble pets, paper plate animals, and pop-up cards) Step-by-step instructions are clearly written, easy to follow, and include plenty of pictures. Whether you are gluing, stitching, or painting, most of the projects require easy-to-find supplies, many of which we already had on hand. Templates are included, making it easy for those of us who need to trace. Although the title says the projects are "for kids aged 3-10," younger children will need significant help from adults. The projects were just right for my seven- to ten-year-old children to complete with little assistance. Checker boards for our road trip in June. Bandanna-covered journals that we are going to use for our summer poem books. Stain glass butterflies decorate our back door. We have more projects that we want to try this summer (notice the flags stuck in our book). I just hope summer lasts a long time. Although Diane wanted to review Independent Study last year, she never got around to it. Since the final book in the trilogy The Testing comes out on June 17, she is coming back with a guest post to talk about the trilogy. Graduation Day by Joelle Charbonneau is the third (and final) book in The Testing Series. Malencia Vale (more commonly known as Cia) and her boyfriend, Thomas, along with many other friends, have been studying at the University. As friends have disappeared, Cia has discovered the terrible things her government does to the people who fail to meet standards at this challenging school. As she gets her schedule (more packed with challenging classes than anyone else’s) and struggles to keep reacting in a “normal” way with this work load, she finds time to start a rebellion, and figure out what is really going on. With a little risk, a little rebellion, some romance, and a lot of stubbornness, Cia manages to finish what she put her mind to without dying. With a happy, but unexpected, and puzzling end, it perfectly sums up the two books preceding it with seamless perfection. Although not foreseen, the end is perfectly clear, yet keeps the reader wondering what Malencia will do next, and what she should do next. This book is not like any other dystopian novel written: the usual predictability, the typical romance, and the horror of the fight. This book moves along quickly—so quickly that the reader barely has time to keep up, but then slows down in the perfect places to make the drama, the violence, and the romantic imperfections seem real. This fast paced book is sure to please any reader wanting an action-packed romance. Right from the first page, the reader is thrown into this dangerous, but pleasing, setting. So, with perfect timing, and a lot of realistic mistakes, Graduation Day is the most realistic (and best) conclusion to a dystopian trilogy I have read. Copy received from publisher for review. Today is the first day of summer vacation, and I am looking forward to tomato and basil sandwiches, star gazing, and time with my kids. I am also looking forward to The Fourteenth Goldfish by Jennifer Holm, The Family Romanov by Candace Fleming, and the final book in Leigh Bardugo's Grisha trilogy, Ruin and Rising. If you plan to be anywhere near Provo, Utah in July, you should attend BYU's excellent Symposium on Books for Young Readers. Nathan Hale, Katherine Marsh, Paul Janeczko, Steven Kellogg, Maggie Steifvater, and Sy Montgomery are all on the schedule this year. I am especially looking forward to hearing Sy Montgomery talk about one of my favorite new books this year, Chasing Cheetahs. Although it is a little early to be thinking about fall, you can put Utah Valley University's Forum on Engaged Reading on your calendar now. October should be lovely in Deer Valley, and Laura Vaccaro Seeger and Steven Sheinkin will be among the featured speakers. And that brings us in a round about way to . . . The 2014 Boston Globe-Horn Book Awards for Excellence in Children's Literature. The judges selected Mr. Tiger Goes Wild by Peter Brown as their Picture Book Award winner. The Port Chicago 50: Disaster, Mutiny, and the Fight for Civil Rights by Steve Sheinkin (you see the connection now, right?) was selected as the Nonfiction Book Award winner, and Grasshopper Jungle by Andrew Smith was chosen as the Fiction Book Award winner. You can read more about the award and the winners here. And while we are talking about books from the past year, check out the 2013 favorites that Tara and I reviewed in the spring edition of The Utah Journal of Literacy.